CMMI for Services (CMMI V1.3 SVC) guides service groups, such as systems engineering, IT operations, logistics, maintenance, IT, finance, accounting and sales, in their improvement efforts. CMMI V2.0 for Services will be released December 2018. Each workshop focuses on using CMMI practices to achieve business goals and solve real problems. Participants start the workshop by identifying their group’s goals and problems. As they learn about each Process Area (PA) they select elements that best help them move towards their goals and fix their problems. 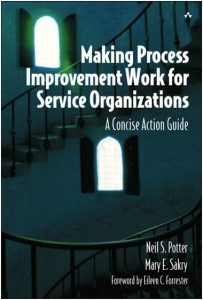 Throughout each workshop we discuss the problems that people encounter when implementing process improvement. These include over-documenting processes, implementing too much change at once, resistance to change, rote use of the CMMI, and maintaining the interest of senior management.